The asylum seekers were evacuated from Quinto di Treviso, a town near the city of Treviso, today after two days of protests. 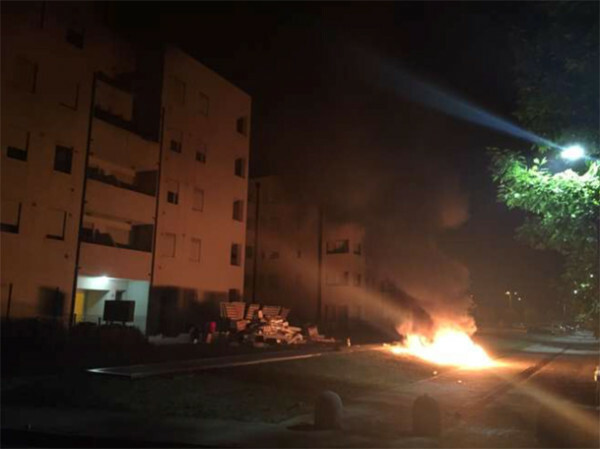 Members of fascist group Casa Pound were among local residents who stormed into the refugees’ accommodation, dragging out furniture, belongings and mattresses which they burned in the street outside. 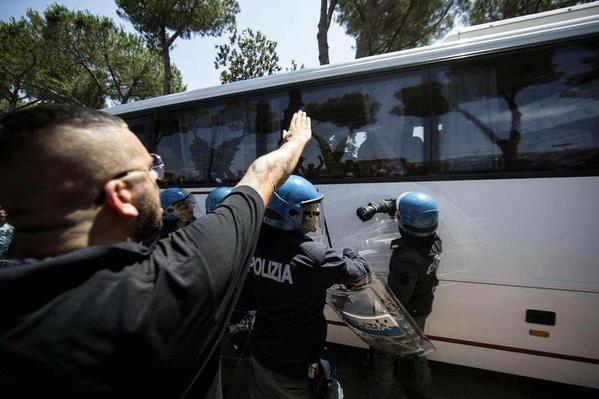 Hard on the heels of the Treviso events, racist protestors in Rome attacked a bus carrying 19 refugees to accommodation in the Casale San Nicola area. Sieg-heiling Casa Pound members were again at the heart of the action. The violent racist protests have been encouraged by the Lega Nord (Northern League). The Lega began as a far right racist and separatist party in Italy’s northern regions. But as we reported in detail on this blog last month, under new leader Matteo Salvini it has ditched separatism and made an alliance with Casa Pound – it is building a national organisation, which in the classic fascist tradition now has both an electoral wing and a streetfighting, activist wing. Luca Zaia, the Lega Nord governor of the Veneto region, which includes Treviso, called in June for officials to clear out refugee reception centres and housing in Veneto, claiming that the sight of the mainly African refugees would have a “devastating effect” on tourism. Zaia has supported the protests, claiming that the region is being “Africanised”. Salvini has announced he is going to Treviso on Saturday. He will be only too eager to whip up the atmosphere against the refugees. Under Salvini’s leadership the Lega has stepped up its racism, directed mainly at immigrants and Roma people. He sees the success of the fascist Front National in France under Marine Le Pen as a model for his own party in Italy. But unlike Le Pen, who strives to hide her fascist politics under a veneer of respectability, Salvini has not hesitated to ally himself with the openly fascist Casa Pound’s activist forces. Amid continuing economic stagnation and austerity in Italy, the Lega and Casa Pound have built by scapegoating refugees, many of whom arrive in Italy after the perilous Mediterranean crossing from Libya, Syria, Eritrea and other war-torn zones. This week’s step into violence, backed and given “legitimacy” by the Lega’s elected politicians, is a very dangerous development.